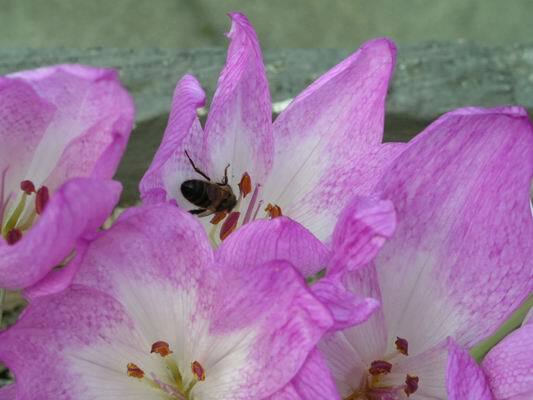 I have to return to the colchicums as they are looking so nice in the fine mild weather. 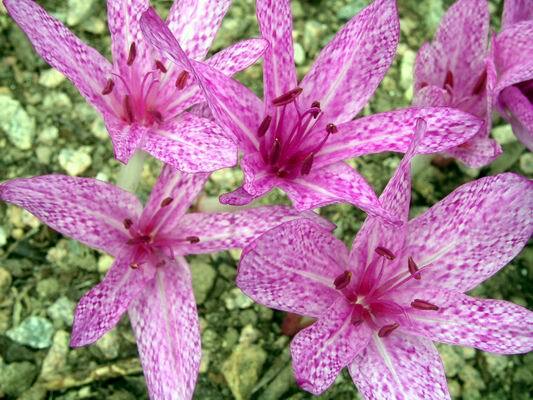 Colchicum agrippinum with that clear checkering, or tessellation to be technical, is so attractive. Looking down into the flowers you can see how they would attract insects, guiding them down to the nectar found at the bottom of the petals. As I was photographing another colchicum wasps were visiting and I managed to get a picture or two. The wasps push down the petals to the bottom of the flower brushing pollen from the anthers onto their backs as they go but the styles are erect in the centre well away from the wasps back so I did not see any pollen getting transferred. I must watch to see if the styles move outwards into the path of the wasps at a later stage. Maybe after the pollen has stopped running, the styles will move out and this could be a mechanism to help prevent self pollination. 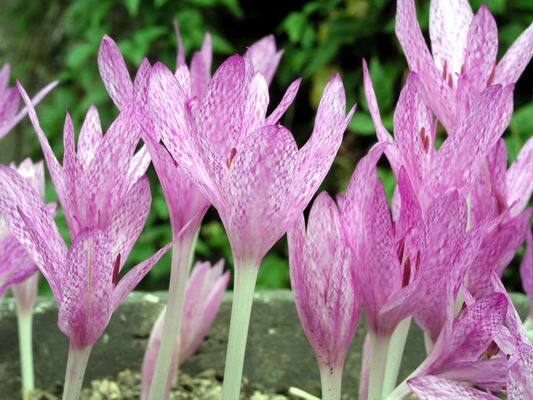 We grow the colchicums with bigger leaves close to trees where not much else will grow and this way their leaves never overgrow smaller plants. 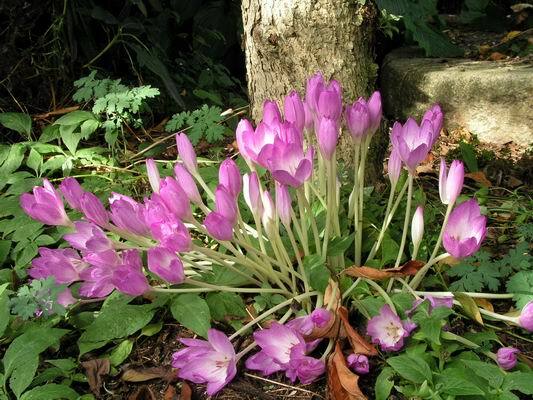 Frankly I like their big glossy green leaves and think all this fuss about colchicums leaves is a myth perpetuated by garden writers who have little experience and no imagination, who continually repeat what someone else once said. 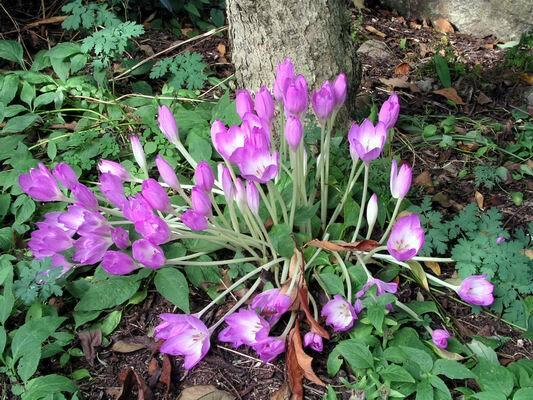 I cannot tell you how often people have repeated the large leave problem to me as the reason they do not grow colchicums but they have a garden full of hostas, Siberian iris, etc!!!! Now I have got that off my chest the reason behind the picture above was to show the difference the light source makes to a picture. I took the above shot while the sun was behind light cloud, by the time I moved the camera down to get a lower level view, the cloud had passed, the sun had come out and you can see the yellow cast it produces in the next picture. With many digital cameras you can adjust the white balance to take into account the light source which will compensate for these colour casts in your pictures. The human brain does this for us all the time but we do not always realise it. 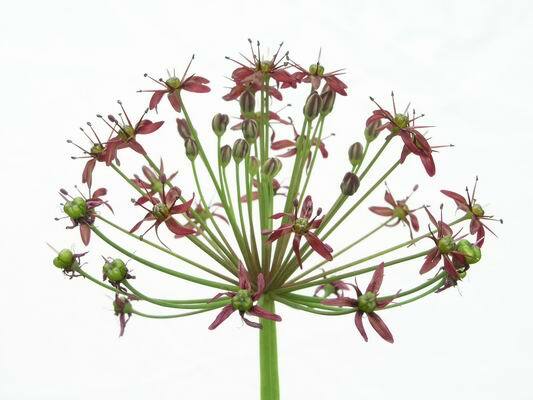 Sometimes when photographing a subject like this allium wallichii it is very difficult to get a satisfactory image because the background always gets in the way. Using a plain back ground forces us to see only the starry nature of the flower head which is not the most showy but has a form and charm worth the extra bit of effort to capture it. I over exposed by + 2 stops to get the flowers colour right and keep the background white. 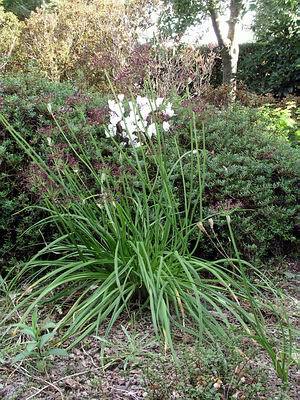 Here is the plant and you can see the leaves well enough but the flower heads are just lost into the background, which includes a white cyclamen. 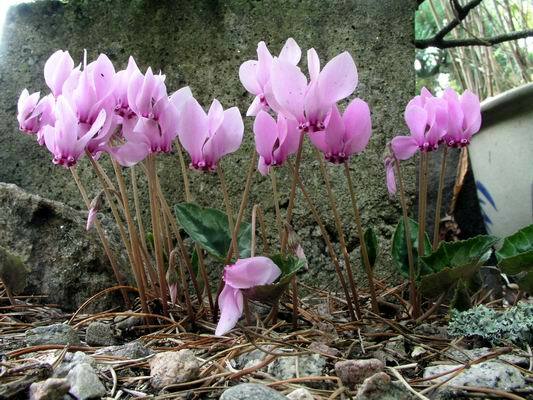 Cyclamen hederifolium album seen here growing from the side of the wall of a raised bed and through a Salix hylematica. 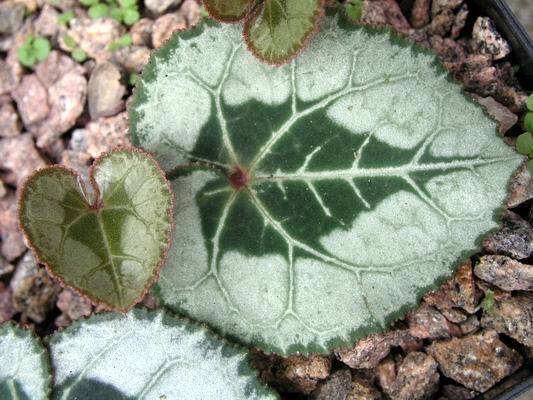 There are lots of Cyclamen hederifolium around the garden all planted by us as we do not have the ants that others have, to spread the seed in such a lovely and random way that is well illustrated in recent postings to the Forum section of this site. 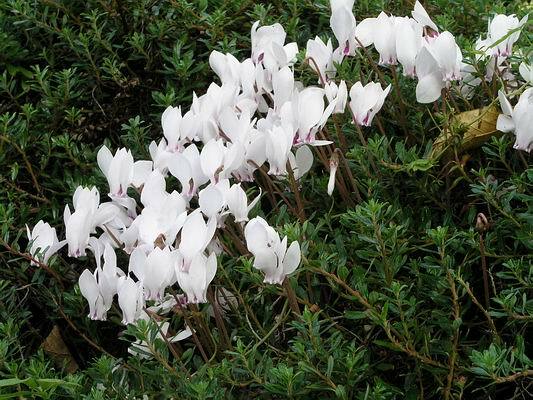 Also in the Forum, John Forrest shows one of the mass produced miniature Cyclamen persicums and I absolutely agree with him that they are worthy of our attention. 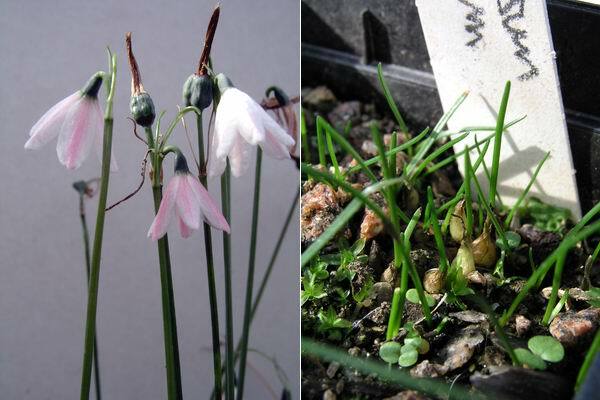 We must not become plant snobs and only want the rare and difficult; some of the best plants are the most common and widely available. The leaves above are from one of these Cyclamen persicums bought in full flower last Autumn from a chain store at a cost of around £1 each. We planted some into the garden, some into a fish box trough and a couple into square plastic pots also kept outside all winter. All have survived and are now coming into leaf and what a leaf this one is. 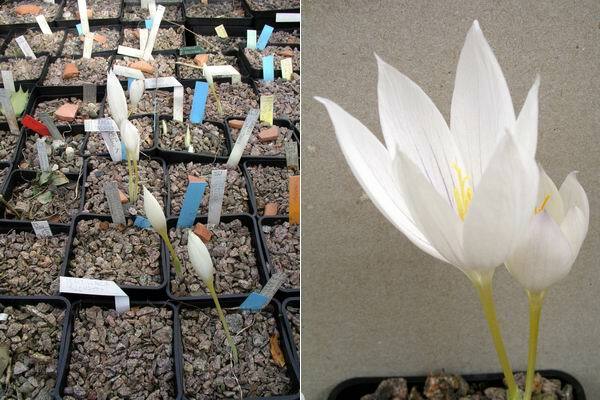 Crocus vallicola is an amazing plant, I continually look for it appearing in the frame but am always caught by surprise by the speed that its flowers appear, one day nothing, next the flowers are 7cms tall. The forms we grow all have the nice blue lines on the petals, the style and pollen varies in colour form golden yellow to pale cream. Since I applied the "storm", some rapid root growth has been activated as you can see above, where the roots are growing through the drainage holes in the pot and escaping into the plunge sand. I do not worry abut this as I do not need to move these pots around but if you want to take plants to a Show it is a problem you have to tackle in some way. 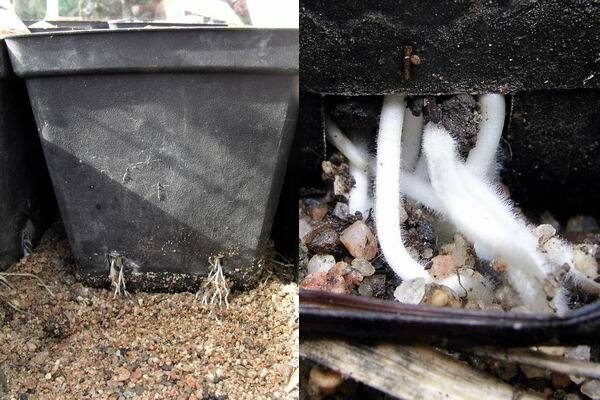 The close up picture of the roots shows the fine root hairs that draw in the nutrients and trace elements that the plant requires at various stages of its growth cycle. Last year I collected and sowed the seed of Leucojum roseum as soon as it was ripe, on 24th September, to see when it would germinate. I had half expected I might get some germination very quickly but this was not the case. Around half the seeds germinated in late spring and the rest are germinating now. As I had not done a trial of the depth to plant leucojum seed, I sowed some on the surface and some half way down the pot. They have all germinated now and you can see the surface-sown ones have a tiny bulb lying very exposed to swings in moisture, temperature and any passing slug.